This F-Pulse was designed to be the best-performing pinpointing probe on the market, answering the call from treasure hunters who demand a robust, modern design and a probe that maintains high sensitivity in the most demanding environments. The F-Pulse is a waterproof, pulse induction detector. 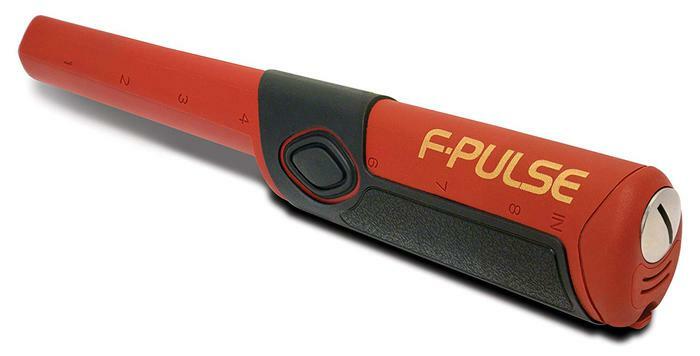 An advanced pulse induction design allows the F-Pulse to operate in environments where other pinpointers fall short. Whether in heavily mineralized soils or saltwater, this pinpointer goes deeper and guarantees stable operation where competitive products false or lose sensitivity. Throw away your 9-volt batteries folks. Welcome to the 21st century! F-Pulse is ergonomic and features easy-to-use one-button operation. It was designed by treasure hunters to take your treasure hunting performance to the next level! Click here for the owners manual.